Eastern woodland sedge is likely the most common sedge in Missouri. It grows in many habitats, including lawns. Like grasses, sedges are annuals or perennials, nonwoody, with linear, parallel-veined leaves whose lower portions sheath the stems. The flowers are spikes: the tiny flower lacks petals and sepals but is enclosed in scales (tiny bracts). The spikes can be in arranged in spikes, racemes, panicles, or umbels. Key features of sedges: Stems are very often triangular in cross-section and are solid, not hollow. Leaves are usually 3-ranked (they come out on 3 sides of the stem) (while true grasses are 2-ranked, opposite). Leaf sheaths are usually tightly closed or fused (in grasses, the sheaths are split open lengthwise). Flower clusters often have 1 or more leaves spreading out from the base. Fruits are 2- or 3-sided achenes (dry, single-seeded fruits that don’t split open). Similar species: Plants in the rush family typically have basal leaves; round, solid stems; and flowers with 3 sepals and 3 sepal-like petals. Fruits are many-seeded capsules that split open lengthwise. Height: some species to 4 feet, but most are much shorter. Oak sedge blooms in early spring in upland forests and is scattered nearly statewide. Gray’s sedge is a great example of how important the fruiting parts of sedges are for identification. 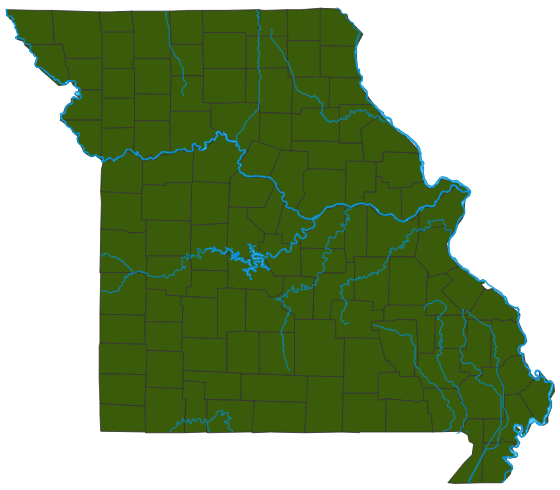 James’s sedge is scattered throughout Missouri. It grows in forests and on ledges and bases of bluffs. The female spikes of Short’s sedge are densely packed cylinders up to 1½ inches long. Bush’s sedge is common nearly statewide. Male flowers form below the female flowers of the terminal spike. The fruiting clusters of fox sedge are elongated and densely packed. The protruding, hairy-looking awns make them look like fox tails. Fox sedge is common statewide and grows in a wide range of low, moist places. It has numerous stalkless flowers crowded into long spikes. Chairmaker’s rush is scattered nearly statewide. It grows along the edges of streams, ponds, lakes, and in marshes and ditches. Chairmaker’s rush is also called common threesquare for its strongly triangular stems. The conical flower clusters of chairmaker’s rush are in groups of 1-4 on wiry, green, sharply triangular stems. Chairmaker’s rush grows to about 3 feet tall and grows from stout, long-creeping rhizomes. Each conical spikelet of chairmaker’s rush contains several florets, each with its own pistil with branching style. Sedges are usually found in wet habitats. Missouri has more than 200 species in the sedge family. Distinguishing between these grasslike plants can be difficult even for botanists, but it’s not hard to learn some basics about this common group. Start by memorizing the phrase “sedges have edges,” which will help you remember their distinctive triangular stems. In many cases, you can tell a plant is a sedge just by touching it! Globally, there are about 4,000 species in the sedge family. In Missouri, more than 60 of our sedges are Species of Conservation Concern; several of them are listed as critically imperiled. Considering the family’s very large size, sedges have a low direct economic importance for humans. Identifying sedge species is tricky even for botanists, who often need to see the rootstocks and use microscopes to examine tiny details of the nutlike fruits. Some sedges are used as ornamentals. Ancient Egyptians used one species to make papyrus paper, and its buoyant stems to make boats. The infant Moses’s basket may have been woven from sedges. Parts of some species are edible. Chinese water chestnuts are the corms (rootstocks) of one type of sedge. Sedges are very important for stabilizing soils in wetlands and stream and lake margins. Their fruits provide food for many kinds of waterfowl and other animals. Dense stands provide important habitat. One species, sawgrass, is the dominant plant in the Florida Everglades.